Daniel 2:20 "Blessed be the Name of God Forever and Ever; Wisdom and Power are His." Daniel is a post-exilic prophet. He was very young when he went on exile to Babylon during Jeremiah's ministry. Daniel has never forgotten the great name of God, Yahweh even though he grew up in the pagan society of Babylon. In the book of Daniel, he refers God as "Yahweh" 6 times. Daniel also lives a life of blessing God's Name. We have a record of Daniel's prayer in Daniel 2:20-23. 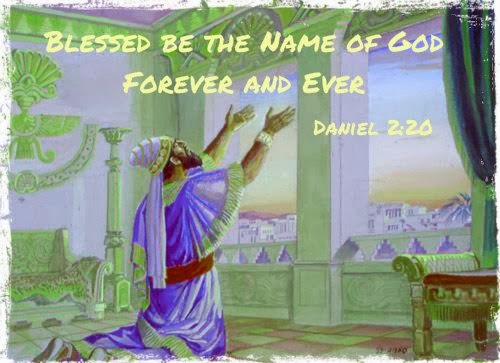 Right at the beginning of Daniel's prayer, he blesses the Name of God FOREVER and EVER. It is always in the hearts of the prophets that God's Name be blessed not only in their times but also FOREVER into eternity. What makes Daniel praise and bless God's Shem? God has poured forth His mercy and faithfulness in answering Daniel's prayers. King Nebuchadnezzar had a dream. The king was troubled and disturbed by his dream but no wise men could tell him about his dream and interpret for him. As a result, the king ordered an execution of all the wise men of Babylon, including Daniel and his 3 friends. Under the threat of death, Daniel and his friends sought mercy and help from God. God disclosed the mystery to Daniel and made known the dream and the king's matter to Daniel. Likewise, when we experience God's mercy on us, we too must come before God in worship and bless God's Name with gratitude.